I’ve always been interested in Indigenous Education and interested in learning more about First Nations culture. As a young child, I lived near Stanley Park in Vancouver and the totem poles fascinated me. After moving to Lillooet at age nine, I began to learn more about the local St’at’imc culture and that continues to this day. More recently, Métis and Cree epistemologies became deeply embedded in my Masters research. In spite of the fact that she attended residential school and never breathed a word about it while she was alive, my great-grandmother’s Métis and Cree family has greatly influenced my values and beliefs, not to mention my teaching philosophy. Indigenous Education is an important part of my practice as an educator. Working in Gold Trail, I was fortunate to collaborate with the St’at’imc Language and Culture Teachers and the Aboriginal Student Support Worker at my school to create lessons and units that combine BC Curriculum with the school district’s Aboriginal Education Enhancement Agreement. Check out page 9 of the Aboriginal Education Enhancement Agreement for photos and a summary of what my class learned in connection to residential schools and reconciliation in 2015, plus see page 29 for my testimonial of the powerful learning that occurred during that process. In January 2017, students learned about colour through the lens of St’at’imc culture. 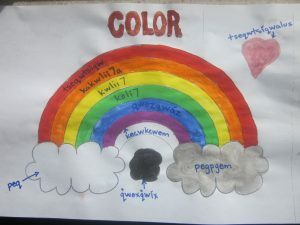 Through storytelling, games and arts-based methods, students learned all the St’at’imc words for basic colours. Using tempera paint, students created St’at’imc Colour Rainbows showing both the language and a natural symbol (the rainbow). We were also very fortunate to be the first class to attend a St’at’imc Culture Camp for students. 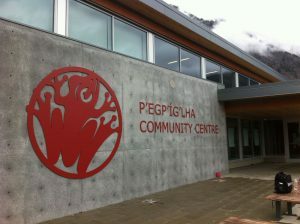 We had a fantastic day of learning at the P’egp’ig’lha Community Center. Students made bannock, played lacrosse, and sewed medicine pouches. We even had the chance to sing and play Lahal in the pithouse with a cozy fire burning! 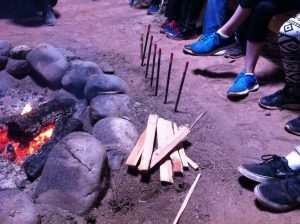 It was an amazing day of traditional indigenous learning. I’ve also worked for years to bring learning on Residential Schools and Reconciliation into the classroom. 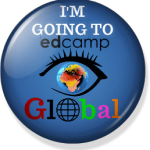 There really isn’t any way to describe this learning except that it is powerful, meaningful and real. I’ve had student look at the Indian Act, read countless picture books and stories to access the content and heard stories first hand from elders that have visited our classroom. The students always amaze me with their capacity to ask deep questions as they wrestle with this topic.